Last Time on Ninja Stuff: I talked about how authors should better appreciate bloggers for all the hard, usually unpaid work they do to promote books. I stated that I think a writer who requests a blogger to feature them should have the courtesy to promote that post should a blogger agree to do them a solid. I also admitted that I'd been a tad too hasty in commenting on a post advocating for bloggers (whom I love) because I didn't think through the ramifications of requiring authors (whom I also love) to promote posts about their work. Today, I want to talk about book bloggers, their relationship to authors, and some behaviors that are definitely not okay. Chief among them is charging or otherwise extorting authors for reviews. Unfortunately, authors are surrounded by folks who want to take advantage of their big book dreams pretty much everywhere they go. There are probably exceptions (please name them in the comments if you know of some), but I would be deeply skeptical of any blogger or review publication that wanted to charge for a review. As an author I don't consider a review I have to pay for to be worth having. Certainly, I would never want to be found having paid for a positive review of my book. Whatever short-term advantage such a review might give me would be far outweighed by the potential risk of my having been discovered buying a planted review. I'd rather let one book get destroyed by troll reviewers than risk the integrity of my entire body of work (of which there will soon be one). As a blogger, I don't want people thinking my opinion is for sale (I will give you a totally biased 5-star review for free). I’ll leave you to discover the negative qualities of each week’s book on your own. What is that!?! If I tried to get a gig as a professional critic someplace, I'd be laughed right out. What kind of reviewer doesn't write criticism? The kind who writes reviews because he loves books and authors and doesn't care that he's not known for being a hard-nosed critic. I'm okay with this because there is no such thing as an objective reviewer. Certainly, there are many reviewers closer to being objective than me, but a review, no matter how substantially argued, is just the opinion of the reviewer. Art is subjective, period, end of story. So is its enjoyment. Bloggers have their own tastes and bias. Some are more objective than others. Over time, bloggers develop a reputation and their readers typically take this into consideration when evaluating their reviews. If a book becomes relevant enough for readers to discuss, a consensus will eventually form, and readers will have their own opinion outside the consensus. Neither my automatic 5-star review or a review written by the author's mom will hold that great a sway. A book attracts readers or it doesn't. And reviews aren't the final word. 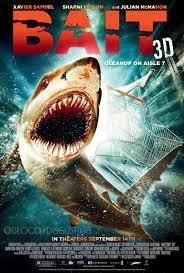 I don't care that Bait 3D currently has an average of less than stellar reviews. I loved that movie. 3D sharks in a grocery store is choice entertainment and I'll never believe otherwise. I would've watched it even if it only had one star and I can't wait for the sequel. Conversely, I still haven't seen The Artist, which won all the academy awards and the hearts of critics everywhere. If it were on, I wouldn't leave the room, but no amount of critical praise is enough to convince me to invest two hours of my life I could otherwise be enjoying Sharknado. I don't think book blogging should be elite. Some bloggers will rise to greater notoriety than others as will some authors, but all should be welcome. Online real estate is plentiful and cheap, so if you like books, why not stake out your lot? If you're an author thinking of establishing or expanding your online presence, you should absolutely consider starting a book blog because then you'll be part of the solution for authors who need to get the word out. Karma will come back to you when you have a book to promote. Trust me, I know. There is no one way to run a book blog. Book bloggers don't have to have any special training and there is no uniform code of ethics for online reviewers. Anyone, anywhere can up and declare themselves a ninja just as anyone, anywhere can up and declare themselves an author, and that is a beautiful thing. All are welcome, which means authors will always encounter conflicting submission guidelines and one-off oddities when seeking book promotion. 1. Post your reviews to sites other than your blog. This is a win/win. People aren't searching Google for "Indiana dad who writes zombie books and has opinions on middle grade fiction" (pity). But they are searching for opinions on books and my reviews are more likely to be seen on Amazon and Goodreads than they are at this blog. Esteemed Readers who like my reviews follow me home, which is a win for me. They also encounter my opinion at a crucial location when they're considering purchasing the book in question, which is a win for the author. Win/win. Do this. 2. Be consistent and fair in your treatment of authors. Readers will turn on you if you're rude to an author. If your average review is 700 words, try to maintain that average for books you like and books you don't. If you savage authors for their shortcomings, make sure you're consistently savaging the same shortcomings across multiple books and writers. 3. Write a review submission policy. You can only complain about authors not following it if you have one. Mine's simple: if it's a middle grade or young adult book, email me. I might say no, especially just now, since having a baby has put considerable restraints on my writing and blogging time. Unless you send me a mass email or form letter (delete! ), I usually respond within a week. 4. Be polite and respectful. You don't have to look at books through rose-colored glasses like I do, but writing books is hard. Whatever you're reading, someone, somewhere probably loved it and worked hard on it (maybe not hard enough, but still). You can write that the book is bad without attacking the author personally. You can treat authors of bad books with the same courtesy you treat authors of great books. 5. If an author gives you an interview or a guest post, they are your guest. Treat them as such and be thankful they've agreed to appear at your blog. 8. Remember that authors are magical. An author is someone stuck half in another world and deserves the benefit of the doubt. Just now I was changing my son's diaper while simultaneously imagining we were surrounded by walking corpses and pondering how we might escape (very practical). I'm not all here and I'm not the only one. Authors sometimes say strange things and behave oddly. So long as they're courteous to you, return their courtesy and understand that an author's aloofness is a natural outgrowth of their profession. If I think of anything else, I'll update this list later. But I think this is a good start. I've got one last bit of advice for book bloggers: you're the reporter, not the story. Always remember that in your dealings with authors, even when it gets difficult, and it probably will at some point. Lois Lowery is a big deal author and rightly admired for her contribution to literature (as are most of the authors who've appeared here, but I had to pick one to make this point). Her accomplishments are hers, not mine (obviously). Any glory that falls on me for having had the good fortune to feature her here is reflected glory. I'm just the guy holding the microphone for a greater talent and I do well to remember it. By and large, authors are very nice people and appreciate their fans. I've had the experience of big time authors being extra nice to me and I highly recommend it as it's awesome. Courtney Summers thanked me in the back of her zombie book (how awesome is that) and of course I thanked her in the back of mine. Darby Karchut's new book, Gideon's Spear, available today, features a blurb from yours truly. Both of these things were a surprise to me as the authors decided to do them without my knowledge and I'm very excited and grateful. Just yesterday in response to the first part of this post, Hugh Howey wrote on Facebook where my mom could see it that I was an "excellent writer." It made me feel warm and fuzzy because I really admire Hugh Howey and I have his email address. I could bug him right not and ask him to read my book, request that he tell me once again how special I am, ask him to give me writing advice, etc. And he's such a nice guy, he might even do some of those things, but it would be wrong of me to ask. This is crucial to understand. If you want to piss an author off, impose on them with personal requests. Hugh Howey's time is not better spent placating me. He's a busy guy and I and all his fans are better served if he spends his time writing his next book, which is something we can all enjoy. He's got a website full of great advice to writers. We can all read it. He arranges fan meetings and next time he does one close to me, I'll try to go as I'd enjoy meeting him in person and that's time he's set up in his schedule to do that. DO NOT DEVELOP A REPUTATION AS SOMEONE WHO EXHORTS AUTHORS. DO NOT ASK THEM TO CRITIQUE YOUR MANUSCRIPT, DO NOT WRITE THEM SIX MONTHS AFTER THEIR REVIEW AND ASK THEM FOR ADVICE. YOU ARE ENTITLED TO THEIR POST AT YOUR BLOG AND THAT IS ALL, AND ONLY THAT MUCH BECAUSE THEY AGREED TO DO IT. YOU ARE BASKING IN REFLECTED GLORY. That being said, the situation does sometimes get murky, I know. I had a well known author insist on critiquing my manuscript without my even hinting I wanted it, though I did appreciate it (I'm not passing that up). Another author insisted on introducing me to her agent. And I don't mind asking authors if their agents or editors would want to appear here as that's my schtick and the author is totally welcome to ignore the request. Part of the reason a writer might want to start a book blog is to network and make writer friends. By meeting so many writers, I've found some really cool people I now consider friends. I tried to be brief and respectful and professional in my emails to Lynne Reid Banks, but every time I did, she emailed me back and we had a lovely correspondence that went on for some time and I treasure it. What's key, though, is that correspondence was on her terms. I didn't expect it and l certainly didn't feel entitled to it. It just happened and it was very nice. I don't expect it to be repeated the next time I interview a childhood hero. To further confuse this issue, I summoned up all the courage I ever had or ever will have, took a crazy leap of faith, and asked Richard Adams to blub my book, and he did. He said he was happy to and I believe him. I don't ask authors who appear here for blurbs anymore because the authors I asked after Mr. Adams did not respond favorably, nor should they have. It was an abuse of my position to ask. As soon as an author politely pointed this out to me, I felt pretty low and I won't do it again. As I've said, there is no hard and fast code of ethics for book bloggers to follow. None of us is specially trained to do this and most of us aren't getting paid. Mistakes happen. But I think if we book bloggers proceed with the understanding that we're doing this for a love of books and authors and that the blog itself is its own reward, we'll be all right. Great post! Blogging should defiantly be out of a love of books and respect the hard work an author puts toward their craft. I spent all my writing time this morning on this post:) So the rest of the week, when the blog is quiet, know that I'm writing fiction instead. Good luck with the launch! Next time I post here, it will probably be about your book. An excellent wrap up to part one. I blog and review children's books as well as writing children's books. I do it because I love to read the genre with my daughter. Oh heck, I love to read the genre with or without my daughter. I love to help out fellow children's authors. I love to give a break to new authors. And it keeps me writing in between manuscripts. It's a win/win as far as I'm concerned. Keep up the good work. And as always, happy reading and happy writing! I hear you. I have 3 boys and love reading children's books and middle grade, but secretly I'd do it even without them. In fact, I do. I too enjoy writing and find that MG is really fun to write!!! Thanks bloggers for all your hard work. Readers and writers really appreciate it. Well, I do at least. I have learned so much about the craft from both bloggers and those that care to post.